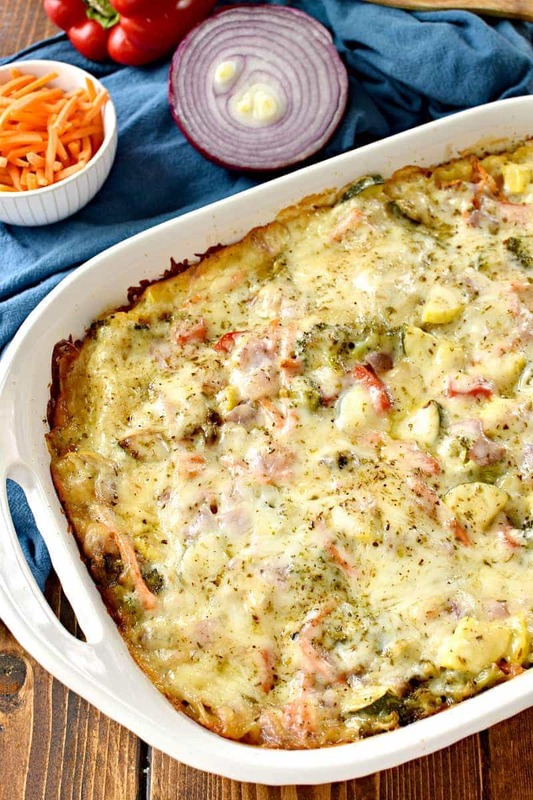 This Creamy Vegetable Lasagna is loaded with fresh summer veggies, three types of cheese, and the most delicious cream sauce! 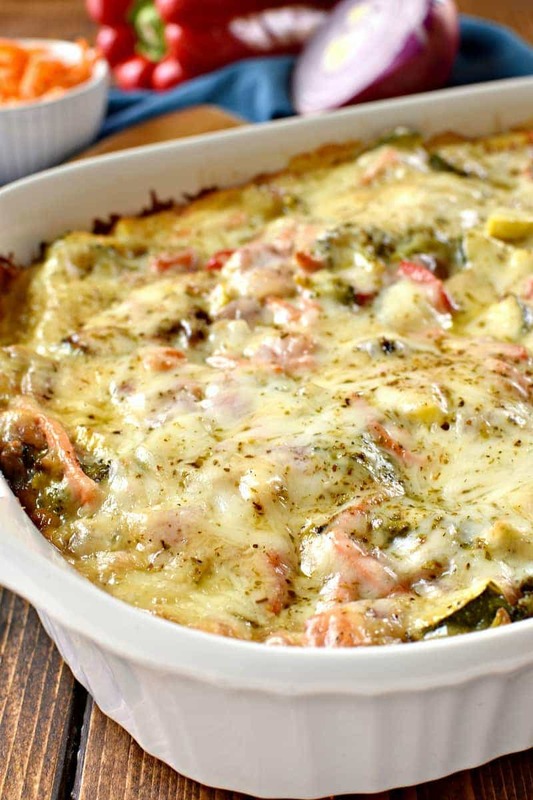 A delicious alternative to traditional lasagna….and perfect for summer! 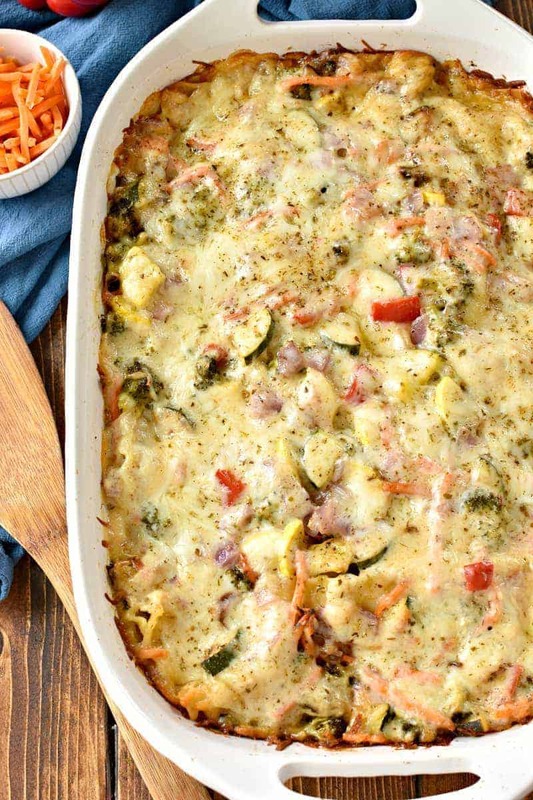 Can I just tell you how excited I am about this Creamy Vegetable Lasagna? Because I AM PUMPED! And not just because it’s so incredibly delicious (which it is) and not just because vegetable lasagna is one of my all time favorites….but because it means I finally have my oven back! Woo hoo! In case you’re wondering what in the world I’m talking about, we’ve been in the middle of a major home renovation for the past six weeks. Which has meant no kitchen, no living room, no table, and definitely no home cooked meals. And you know what? As much as I sometimes complain about making dinner (don’t we all?) I’m honestly SO excited to have my kitchen back. I guess absence really does make the heart grow fonder!? I’m excited to be able to make things like Blueberry Granola Muffins and Roasted Vegetable Enchiladas and Taco Pot Pie. All the things we’ve been missing for the past 6 weeks! And I’m SO excited about this Creamy Vegetable Lasagna….the first meal I made in our new kitchen. 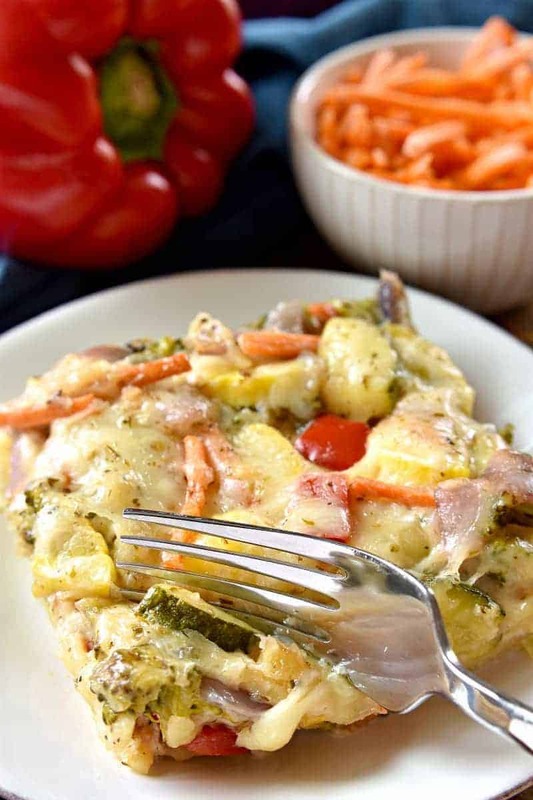 Have you ever had vegetable lasagna? I actually like it more than I like traditional lasagna, which is saying a LOT. 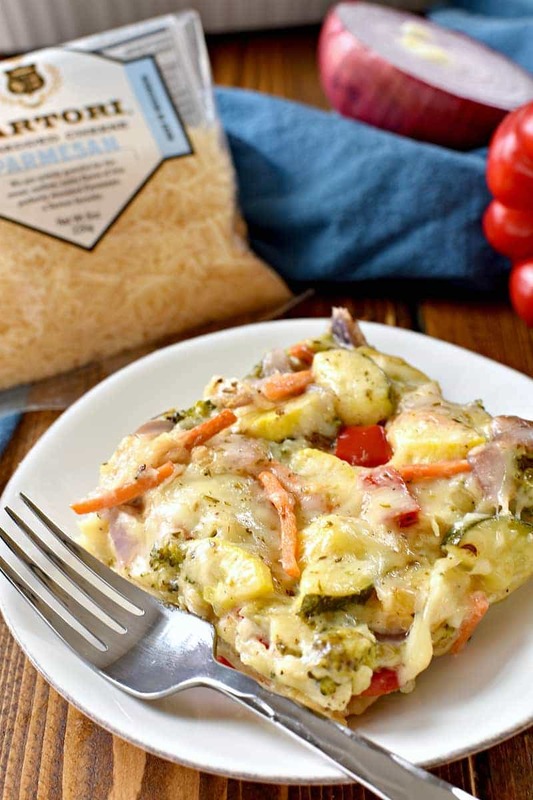 I love the fact that you can load it up with all your favorite veggies….and the cream sauce? It’s absolutely to die for. But what really makes Creamy Vegetable Lasagna SO amazing is, of course, the cheese. I decided to pack in three different kinds of cheese, including the BEST Sartori Shredded Parmesan Cheese. 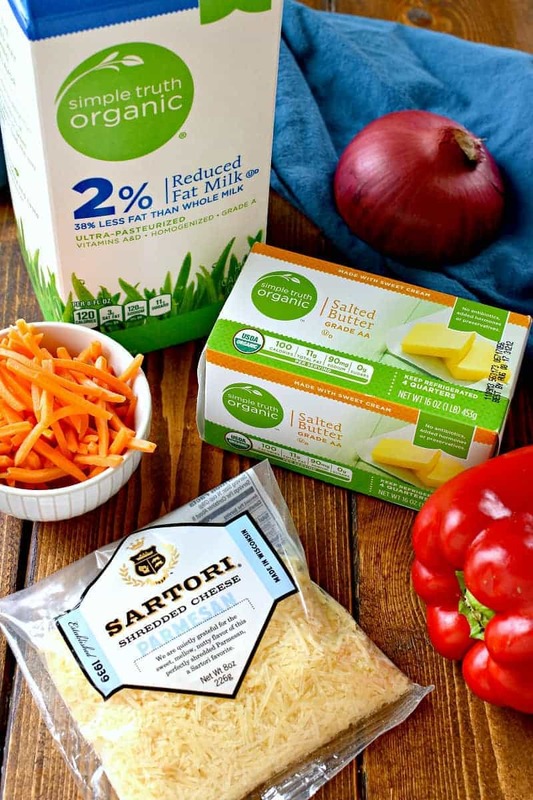 I love that Sartori is a fourth generation, family-owned company based right here in Wisconsin! And I absolutely LOVE their cheese. I picked up everything I needed at my local Pick ‘n Save (which, by the way, has all the best summer veggies right now)….and the rest? Well, the rest is delicious history. This Creamy Vegetable Lasagna was gobbled up by my entire family….and I can’t wait to make it again and again. ALL summer long! In my brand new kitchen. Not that I’m excited or anything…..
For more recipe inspiration, visit Pick ‘n Save’s website or find them on Facebook, Pinterest, and Twitter. 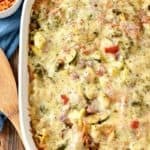 This Creamy Vegetable Lasagna is loaded with fresh summer veggies, three types of cheese, and the most delicious cream sauce! A delicious alternative to traditional lasagna....and perfect for summer! Combine all ingredients in a medium mixing bowl; set aside until ready to use. Heat 2 Tbsp. olive oil in a large skillet; add veggies and saute until tender-crisp. Combine butter & garlic in a medium saucepan; heat over low heat until butter is completely melted. Stir in flour, stirring constantly. Cook over medium heat until thickened, stirring constantly. Add Parmesan cheese, oregano, salt, and pepper and stir until smooth. Spread a thin layer of sauce on the bottom of a greased 9x13 inch baking pan. Top with a single layer of noodles, 1/2 of ricotta mixture, 1/3 of vegetable mixture, and 1/2 of sauce. Top second sauce layer with remaining vegetables, 1 c. shredded mozzarella, 1/2 c. shredded parmesan, and 1/2 tsp. dried oregano. Cover with foil; bake at 375 degrees for 1 hour. You’re the cheese queen between the grilled cheese yesterday and this one! I love it! This is totally my kind of lasagna! I would love to have some of this right now! This looks incredible! I love veggie lasagna but have never made it from scratch. Printing the recipe to pick up ingredients this weekend! Oh my goodness, this looks incredible!! I bet it tastes amazing!! My family would love it! How awesome that you have your kitchen back! And what a great dish to christen it with. Oh my gosh! SOO chock full of vegetables! Love it! I love the addition of the broccoli! Delicious! Made exactly to recipe except substituted summer squash for orange pepper (couldn’t find summer squash in my grocery store). Make sure to allow it to cool enough in the pan before you slice and serve otherwise it’s quite soft and will slide apart. Flavour was excellent! Where can I find nutrition info for lemontreedwelling recipes? I made this last night for dinner despite my strong dislike of squash and was surprised at how tasty it was! Even my 4 yr old and 17 mo old devoured it without complaining (win!). I was worried that it would be too liquid-y with all that sauce but after baking, it was just the right consistency. Thanks for sharing!! I will definitely be making this again! This is my new go-to lasagne recipe!!! As a vegetarian, it’s difficult to find a great vegetarian lasagne recipe. This is beyond amazing and very flavorful! Only thing that was a little confusing was the last 4 ingredients and step 4. I was confused when making the sauce if these ingredients went in the sauce, due to the ingredient list, But, I kept reading the directions and realized these additional ingredients get added as a topping, once you’re done layering. It seemed odd not to have a top layer of noodles, so after my second layer, I covered with another layer of noodles. Then, I added the last 4 ingredients from the list. I suppose without the last noodle layer it would’ve saved me some carbs, but it turned out great regardless. Thanks for sharing this great recipe!!! I never comment on recipes, but this one was so incredible and delicious, I had to. SO YUMMY. 10/10 would make again. And my husband LOVED it. This is the most delicious veggie lasagna I have ever had! !